Duke Roofing was founded over 40 years ago and continues a long tradition of serving customers to solve roofing challenges. Our well-known customers continue to choose Duke Roofing because our focus is not just on how to install roofing systems, but rather on understanding unique needs and knowing why a particular system makes sense. Many of our installations are still water tight 20 years later. We can provide you with the latest nationally approved roofing specifications and details required to solve your most complex roofing problems. Our classroom and field trained union Journeyman are experienced in the application of nearly all of the quality roofing materials and specifications on the market today. From asphalt to pitch, hot or cold applied, single ply plastics/ EPDM rubber membranes, to shingles, we even have two recognized journeyman slaters, and we also carry a stock of roofing slate for your convenience. All our Duke employees have obtained or are apprenticing to become nationally certified Journeyman Roofers, including 4 years of schooling. Our commitment to quality ensures they have exceptional training to our highest standards to provide workmanship quality. We aren’t just roofers we are ANTI-AQUA ENGINEERS. We work not only with tried and proven roofing materials, but also in the development of new and experimental materials. We have even participated in architectural design reviews regarding roofing failures and alerts. All of our specifications, drawing, and flashing details meet or exceed the specifications and recommendations of the roofing manufactures, life the NRCA – SMACNA - the National Slater’s and the wood shingle organizations. 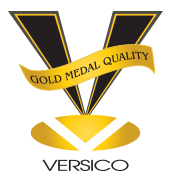 VersiWeld TPO membranes from Verisco are ENERGY STAR® qualified and CRRC rated. Enhanced with Versico's high performance OctaGuard XT™ Weathering Package, VersiWeld membranes offer extreme weatherability and long-term performance. We have designed and installed a variety of steep slope systems from asphalt shingles to natural products like slate and shake to synthetic products and metal. Contact us and let us design the perfect system for your application and aesthetic requirements. At Duke Roofing our main goal is ensuring the client is completely satisfied. We achieve this by working with the client in the most critical phase from the beginning to design the best roofing system for each specific structure, according to the tastes of the client to ensure a water-tight, long-lasting roof. Duke Roofing has been privileged to work with and for numerous manufactures, architects, the University of Michigan, and EMU in the testing, selection and specifications of roofing systems and flashings details for over fifty two years.